Here are answers to the most common two-shot injection molding-related questions we’ve heard over the past few decades — and we’ve heard a lot! Jump to a section using the links below, or simply scroll down to satisfy your curiosity about two-shot. Do you offer molding options other than two-shot injection molding? What materials are best for two-shot injection molding? What design considerations should be made for the two-shot injection molding process? How much does two-shot injection molding cost? TPI is located in Bad Axe, Michigan. You can drop us a note online, give us a call at 989-269-9791 or email us at plasticsales@geminigroup.net. Thumb Plastics, Inc. (TPI) is Gemini Group’s two-shot injection molding business unit. We typically work with large customers such as automotive OEMs, Tier 1s, and Tier 2s. The majority of our accounts have volumes of at least 10,000 parts annually and have an annual buy over $100,000. If this sounds like you, we should connect. TPI is ISO 14001:2004, ISO/TS 16949:2009, and WBENC certified. View our Certifications page. We work with a variety of plastic resins. For a complete list, please visit our Materials page. We manufacture injection molds, trim and fabrication tooling, and assembly fixtures in-house. The two-shot injection molding process combines two different plastic resins in one machining cycle. To realize the full benefits of this process, you should choose two compatible materials that can form a molecular bond while simultaneously meeting the functional requirements of your part. 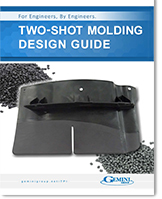 Learn about the most common two-shot injection molding materials in our Two-Shot Design Guide, or contact us if you need help choosing compatible materials. Two-shot injection molding is the ideal process for complex parts. As such, part design often requires a high level of refinement and sophistication. That’s why we’ve developed a Two Shot Design Guide. It provides the foundation you’ll need to start designing for the two-shot molding process. Two-shot injection molding eliminates the need for secondary processes such as welding and assembly. As such, piece prices tend to be lower for two-shot molded parts compared to multi-component single-shot assemblies. The tooling for two-shot, on the other hand, tends to be more complex and costly than single-shot. Therefore, two-shot injection molding is most cost-efficient for high-volume productions. Request a quote today to see if two-shot molding is the right solution for you. Contact us today to learn more about the two-shot molding process and Gemini Group’s injection molding division.